Alan Marks and his team at Realty Executives Boston West hit the jackpot recently, landing at No.777 on the Swanepoel top 1000 brokerages list. The achievement is Boston West’s first recognition on the list since opening its doors in 2005. The Swanepoel top 1000 list is created annually by the staff at T3 Sixty, the leader in analysis of annual trends and industry leaders. Each year, T3 Sixty compiles information from approximately 2,500 of the largest brokerages, franchisors and holding companies in the United States. This information is then analyzed to create the comprehensive report. In total, Stefan Swanepoel, a leading visionary of real estate trends, and his team at T3 Sixty invest approximately 1,100 hours into creating the list. Realty Executives International president, Patrick van den Bossche, takes pride in Boston West’s inaugural showing on the prestigious list. 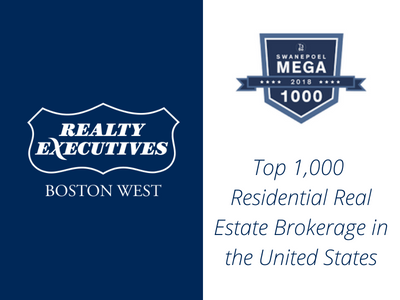 “Realty Executives Boston West being named to the 2018 Swanepoel Mega 1000 is a benchmark of achievement by Alan Marks and his team and their commitment to providing the best professionals to service the industry,” van den Bossche said. Marks said Boston West’s growth is credited to a new focus on marketing and high-performing Executives. Marks’ new focus on marketing the company brand began in 2016 when he brought in Erica Wallace and her team of marketing professionals. This enhancement stage has lead to Boston West opening it’s fifth location in Wellesley, Massachusetts, later this month. Marks believes the company growth and finding a spot on the list for the first time is a testament to the hard work of his real estate professionals. Kathy Foran (#1 Framingham Agent), Craig Morrison (#1 Ashland Agent), and Kathy Chisholm (#1 Holliston Agent) rank amongst the top three executives at Boston West and played a large role in its success this year, each bringing in over $25 million in sales. Despite this huge accomplishment for Realty Executives Boston West, Marks has his eyes set on the future and believes this success can be perennial. Boston West is currently home to 80 real estate professionals. Marks wants this number to grow to 100, however, he is more committed to the quality of his Executives rather than the quantity. “We want engaged professionals with a great reputation in their local community who stay on top of trends in the industry and serve their clients at a very high level. Boston West was one of nine Realty Executive branches named to this year’s Swanepoel top 1,000 list.